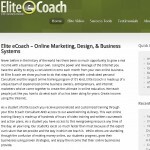 “Elite eCoach”, by Folusho Orokunle and found at eliteecoach.com, is his dubious personal business coaching site. We will get into details about the system but first a few things about the man. Orokunle has a questionable reputation mainly for associating with infamous scammer known as Jason Ryan Isakens among other aliases. Another alias Orokunle uses is Flo. This is also untrustworthy branding, when one goes looking for a stable brand name one can trust and instead finds different aliases. In an already shaky industry full of untrustworthy business and personal coaches, going by different names makes one look rather shifty. Orokunle runs a fake online marketing review site called Federal Reviews, although why they choose to use the word federal is anyone’s guess. It’s certainly not authoritative as the misnomer would have you believe. The Elite eCoach owner’s review site often lauds well known scams, so one would take a gander at thinking he might be in their pockets in exchange for positive shill reviews. Furthermore, almost every “review” on that site is a copy of those posted on Isaksen’s sites. Being associated with scam sites does not bode well for Elite eCoach. Especially since Elite eCoach charges almost a hundred bucks a month just to learn what you can learn for pretty much free anywhere on the internet if you just do some deep research. There is much hype and little substance to the presentation on the Elite eCoach site. Boasts of the “award winning eLibrary”, for example, are highly doubtful, as they never state where the award comes from. Elite eCoach likes to throw around made up names like Mass Market Authority which sound lofty, yet are meaningless. The made up title for things like PayPerClick, link posting, back link tricks and other outdated marketing techniques may sound impressive, but there really is not much at Elite eCoach that you can’t find elsewhere online for far cheaper. They use typical demeaning tactics used by scammers such as suggesting not getting Elite eCoach if you are lazy, motivated or serious, etc. These scammer devaluating tactics are outmoded. None of what you will see on the Elite eCoach site really builds trust, which is the most important aspect of engaging people and drawing them to your business in this day and age. The main point of Elite eCoach gimmicks are just to get you in then bait and switch you with far more expensive upsells to useless programs that won’t get you very far. I found it curious that whenever I went to resource sites with Orokunle’s name in the keywords, each almost instantly redirected me to some website analytics site with a brief tiny glimpse into what was there before. This is a typical tactic used many scammers to scrub their online reputations clean, and that is a big red flag to watch out for with Elite eCoach. This sleazy method makes it more difficult to locate true findings about perpetrators of rip off sites and it looks like Orokunle might have something to hide. What I do know that Elite eCoach might be wanting to hide is that their main goal in life is to get their prey to keep spending thousands a dollars for very little in return, as many coaching scammers are wont to do. All the real sites with user comments point to a majority of unsatisfied victims of one or another scam run by Elite eCoach owner Orokunle and his cohort. I can truly say that Elite eCoach will leave you with a bad experience and at least a near empty bank account, so better to move along swiftly on this scam.